Dimensions: 40" x 52 "
Dimensions: 22 1/2" x 30"
Dimensions: 22" x 30 "
"Black Kin/ New Kin: The Forest Burns At Midnight," is an interdisciplinary installation, performance and video works that examine the realities of climate gentrification in the Black Diaspora communities of South Florida. In scavenging rock segments, flowers and plant matter between Little Haiti and Overtown, the work traces and maps out historical precedents that have defined these communities in the last seventy years. 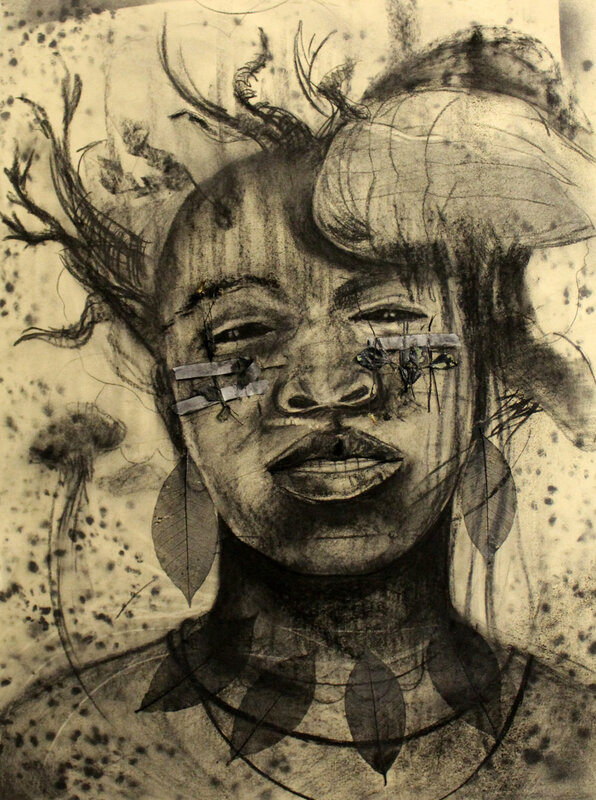 Using motifs of the New Jim Crow and popular black media the metaphorical "burning forest" alludes to episodes of violence and social-environmental trauma on black bodies. As a forest burns, fire consumes everything in its path leaving behind a devoid landscape and charred carbon footprint of its prior histories. Night, a veil of mischief and fear overtakes the body like the doomsday clock; people of African descent are chastised, disposed and vilified in their communities restricting the Diaspora of cultural growth, communal preservation, and legislative protection resulting in a burning absence of identity. In the event black bodies cease to exist with the threat of climate gentrification, the land the Diaspora inhabit still hold the cultural memories and genetics of their existence; the trees, plants, and flowers are gatekeepers of time; they anchor the dreams and hopes of the community. Proposed video works and installation includes the crack epidemic of the 1980's, documented cases of police brutality, sentencing disparities against blacks and the lasting social impact of these practices on the community. In addition to video works, drawings will accompany the installation confronting the viewer with the inconvenient truth in how the Diaspora navigates the western gaze of capitalism but feared and dismissed in social spaces such as Starbucks, Waffle House, and Malls. stain the pavement in crimson red. brown skin dances in the sultry summer. painted as laughter on the smear of our faces.